Holds up to a 33’ tape measure. Glove clip on the side. 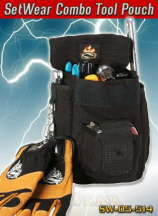 Securely holds all your tools. Holds your tape measure and gloves all in one. Multiple pockets inside for many types of tools. Hook and Loop closure design so you don't lose your tools.